Mary Barber was an Irish poet who mostly focussed on domestic themes such as marriage and children although the messages in some of her poems suggested a widening of her interests, often making cynical comments on social injustice. She was a member of fellow Irish poet Jonathan Swift’s favoured circle of writers, known as his “triumfeminate”, a select group that also included Mrs E Sican and Constantia Grierson. She was born sometime around the year 1685 in Dublin but nothing much is known about her education or upbringing. She married a much younger man by the name of Rupert Barber and they had nine children together, although only four survived childhood. She was writing poetry initially for the benefit and education of her children but, by 1725, she had The Widow’s Address published and this was seen as an appeal on behalf of an Army officer’s widow against the social and financial difficulties that such women were facing all the time. Rather than being a simple tale for younger readers here was a biting piece of social commentary, aimed at a seemingly uncaring government. 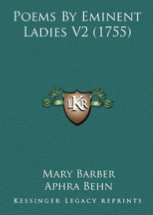 During the 18th and early 19th centuries it was uncommon for women to become famous writers and yet Barber seemed to possess a “natural genius” where poetry was concerned which was all the more remarkable since she had no formal literary tuition to fall back on. The famous writer Jonathan Swift offered her patronage, recognising a special talent instantly. Indeed, he called her “the best Poetess of both Kingdoms” although his enthusiasm was not necessarily shared by literary critics of the time. It most certainly benefitted her having the support of fellow writers such as Elizabeth Rowe and Mary Delany, and Swift encouraged her to publish a collection in 1734 called Poems on several occasions. The book sold well, mostly by subscription to eminent persons in society and government. The quality of the writing astonished many who wondered how such a simple, sometimes “ailing Irish housewife” could have produced such work. It took some time for Barber to attain financial stability though and her patron Swift was very much involved in her success. She could have lost his support though because, in a desperate attempt to achieve wider recognition, she wrote letters to many important people, including royalty, with Swift’s signature forged at the end. When he found out about this indiscretion he was not best pleased but he forgave her anyway. Many of her poems were in the form of letters written to distinguished people, such as To The Right Honourable The Lady Sarah Cowper and To The Right Honourable The Lady Elizabeth Boyle On Her Birthday. These, and many more, were published in her 1755 collection Poems by Eminent Ladies. History sees her, unfortunately, as a mother writing to support her children rather than a great poet, and little lasting value has been attributed to her work. Mary Barber died circa 1755 which would have made her around 70 years old on her death.